Now here is a mask for you that sounds good enough to eat, right?!?! 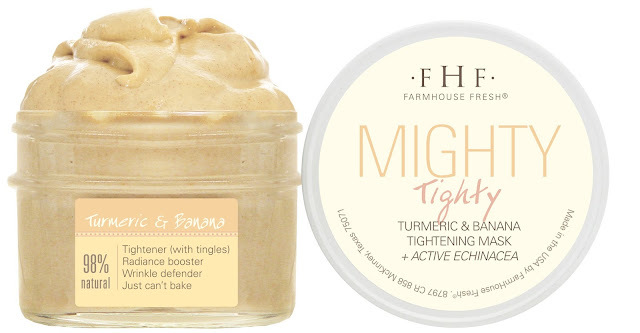 Introducing FarmHouse Fresh's NEW Mighty Tighty Tumeric & Banana Tightening Mask! With powerhouse ingredients like banana, turmeric, and echinacea, you are destined to see some great results in your skin like tightening and firming as well as boosted radiance. Turmeric has anti-inflammatory properties, while banana pulp and banana peel are rich in bioactive compounds including antioxidants, provitamin A, carotenoids and phenolics that help skin with healthy growth, repair, and protection. This 98%-natural, vegan mask featuring a phthalate-free, all-natural fragrance, and contains 3 different clays (Illite, Bentonite and Kaolin), which together pull impurities, toxins and excess sebaceous oils from the skin’s surface, helping to purify and detoxify. FarmHouse Fresh does state that this tingly NEW Mighty Tighty Tumeric & Banana Tightening Mask is not for sensitive skin. I do have somewhat sensitive skin. However, I was still able to tolerate this mask. So, I recommend that you do a patch test before trying this mask if you fall into the sensitive category. To use, just apply this mask to gently cleasned skin. Let the mask dry for about 15 minutes and then rinse off with tepid water. This mask retails for $30.00 for a 3.2 fl oz jar (which contains approximately 14-18 applications).